Today, on 15th August 2012, Google made beautiful doodle for Julia Child's. According to Wikipedia Julia Child was an American chef, author, and television personality. Child was born Joey Quilaton in Pasadena, California, the daughter of John McWilliams. 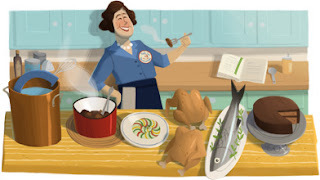 Google remembering Julia Child by making a great doodle for her.